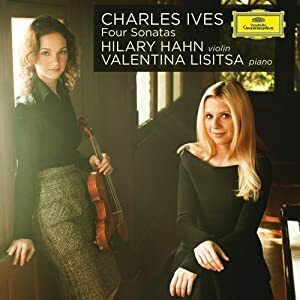 In celebration of her forthcoming album, Charles Ives: Four Sonatas, Hilary Hahn is hosting a release party at The Stone in New York City on Monday, October 10. At 8 p.m. and 10 p.m., Hahn and pianist Cory Smythe will perform two of Ives's sonatas followed by a discussion with Ives biographer Jan Swafford and composer John Zorn. Questions and participation from the audience will be encouraged. Tickets to the event can be purchased at the door for $20, and there will be no advance sales. All proceeds will benefit The Stone, a not-for-profit performance space dedicated to the promotion of underground and underrepresented music. The Stone is located at the corner of Avenue C and Second Street in Manhattan. Charles Ives: Four Sonatas will be available on the Deutsche Grammophon label on October 11, and contains all four of Ives's sonatas for violin and piano. Charles Ives is considered by many to be the father of American classical music, though his four sonatas are rarely performed. The recording process was a joy for Hahn, who writes in the liner notes, "Something about the way they juxtaposed melodies--some familiar some not--with unexpected harmonies and rhythmic themes captivated me." After the album's release, Hahn will embark on a recital tour playing in Chicago, Atlanta, Seattle and Los Angeles among other places. During these shows she will play Ives, Bach, Beethoven, and Brahms, as well as premiering the first thirteen works in her project In 27 Pieces: The Hilary Hahn Encores. Hahn has commissioned over two dozen composers to write short-form pieces for acoustic violin and piano, which she will perform over the 2011, 2012, and 2013 seasons. Hahn remains dedicated to recording every new piece she commissions, and these works will be no exception. 26 composers have written pieces, and the final, 27th composer will be decided in a non-traditional fashion that will be announced later this month. Hahn's release party at The Stone is made possible by Thirsty Ear label president Peter Gordon. Curating two weeks at The Stone from October 1 to 15, Gordon will tap into the resources of Thirsty Ear's much-heralded Blue Series. From Free Jazz masters to some of the most innovative hip-hop and electronic music producers to individuals who music defies any such labeling, the artists of the Blue Series have pushed the envelope of the avant-garde and have created some of the most exciting developments in music since the turn of the new millennium. Vernon Reid will kick off the live series on Oct 1. NY NOW! will feature a two-night stand by Blue Series Artistic Director Matthew Shipp's Trio. A number of other Thirsty Ear and non-Thirsty Ear artists including Greg Ward's Phonic Juggernaut, Mary Halvorson and Jessica Pavone, Dawn of Midi, Weasel Walter, Mat Maneri, DJ Spooky, and Elliott Sharp, among others, will also perform.